Porthcawl - Rest Bay Beach01656 815338work BeachRest Bay is a popular beach with miles of fine quality golden sand and some rock pools backed by low cliffs and The Royal Porthcawl Golf Club. Excellent for water sports, beach surfing, canoeing, kite/wind surfing and body boarding; a Surfing Academy offers lessons during peak season. Very good for walking - you can walk along the coastline to Pink Bay and beyond. The Bay takes its name from the 1880 Rest Convalescent Home, which overlooks the Bay and was built with advice from Florence Nightingale. Blue Flag and Seaside Award beach. Toilets, café bar, parking. Lifeguard service provided 10:00 - 18:00 daily 25 May to 1 September & 7 - 22 September 2019 weekends only. No dogs allowed May to end September. 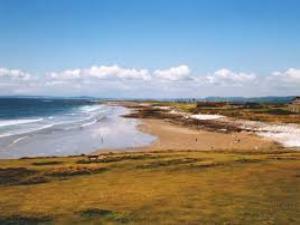 Rest Bay is a popular beach with miles of fine quality golden sand and some rock pools backed by low cliffs and The Royal Porthcawl Golf Club. Leave the M4 at Junction 37 and follow signs for Porthcawl town centre. At a roundabout after 3 miles, take 3rd exit (right) onto Newton Nottage Rd, which soon becomes Fulmar Rd, following signs for Rest Bay & Nottage. Follow this for 0.75 mile; Fulmar Rd does a sharp left and becomes Mallard Way West. After 200m, turn sharp right and after about 500m, there's a car park by the Rest Bay lifeguard station. Rest Bay is several miles from the town centre bus stop, so you will either need to walk or join the road train which runs from Porthcawl promenade and stops at various points en-route.